Griffith is the big boy, among the litter of four “Welsh” kittens. 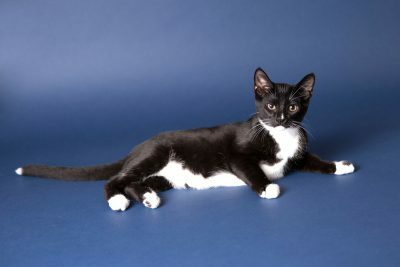 Like his tuxedo brother and sister, Griffith has a unique spot–in his case, on his left paw, as well as a white tip on his tail. Griffith is initially shy, but once he gets to know you and his environment, is a fun, lovable lap-cat, who enjoys receiving kisses. 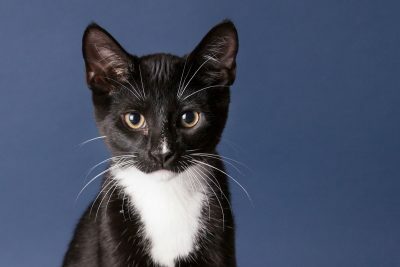 He also gets along great with other cats, engaging in gentle play, and snuggling up without care. 2010-11-18: Lucky Griffith has found his forever home with the same family who adopted Trystan (now called Smooch) from the Welsh kitten clan. Both brothers are having a great time in their new home, as they rekindle their friendship.